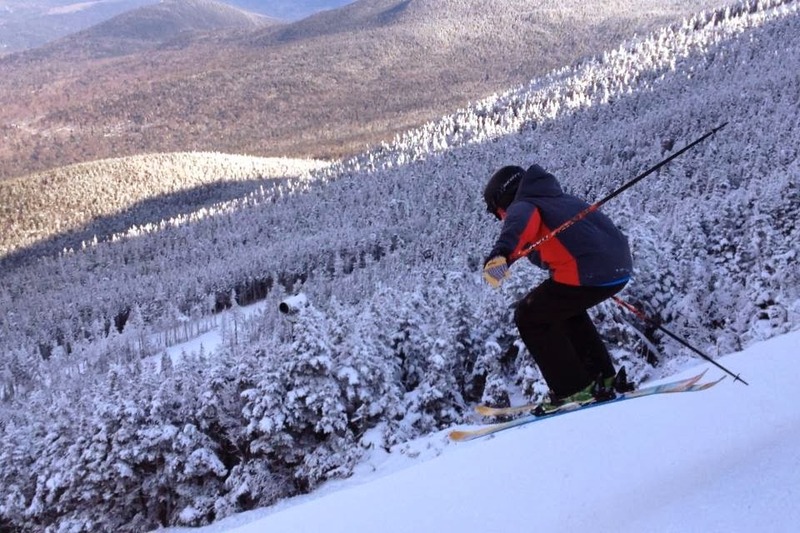 A Family Skiing in Maine: Saddleback January 18 2014 - Good but More Snow Please! Saddleback January 18 2014 - Good but More Snow Please! We made a day-trip up on Saturday up to our home turf, Saddleback Maine. It has been one whacky weather winter so far. It seems to be either extreme cold or it warms way up and rains. I like the middle ground - moderate cold and lots-o-snow. Come on Winter! All things considered Saddleback is holding up well. The snow making trails have plenty of cover and as usual, we had a really good time. We were hoping for a bit of snow during the day but the snow stayed south. Nothing worse than returning home to snow in your driveway when it didn't snow on the mountain. I do have to say it is the most ice I have ever seen on the groomed Saddleback runs. By mid-day things just got scrapped off which really exposed the layers of blue badness underneath. We stuck to the sides of the trials but it was hard to avoid. I don't want to discourage you from going up. It is still a lot of fun but get there early to take advantage of the fresh groom. Take a look at my Twitter feed and Facebook pages for some GoPro video edits by the boys. I also embedded @alecphoto video edit below. Winter will come back soon! Lots of ski season left!